I needed a birthday cake for a friend who can’t eat gluten. I’d never tried any gluten free baking but did remember a cake my granny used to bake when I was a kid. The recipe uses finely ground hazelnuts instead of flour, so it’s perfect if you want to avoid gluten. And the hazelnuts combined with cocoa powder also give the cake a wonderfully deep flavour and a light, moist texture. Gluten free and with extra flavour thanks to the hazelnut-cocoa base: The perfect alternative. The butterflies and leaves are cut out of icing using Lakeland icing cutters. I was going to make flowers originally, but then just really liked the idea of butterflies nibbling on clusters of blueberry-flowers. Preheat the oven to 180°C. Grease two 20cm diameter cake tins lightly with butter. Beat the butter, adding the sugar until the mixture becomes creamy. Beat in the vanilla essence, then gradually add the beaten eggs until the mixture is well combined. In a separate bowl mix the finely ground hazelnuts with the cocoa and baking powder. Add to the butter mixture and fold in gently. Divide the mixture between the two cake tins and bake for 20-30 minutes, or until a skewer inserted in the centre of each cake comes out clean. 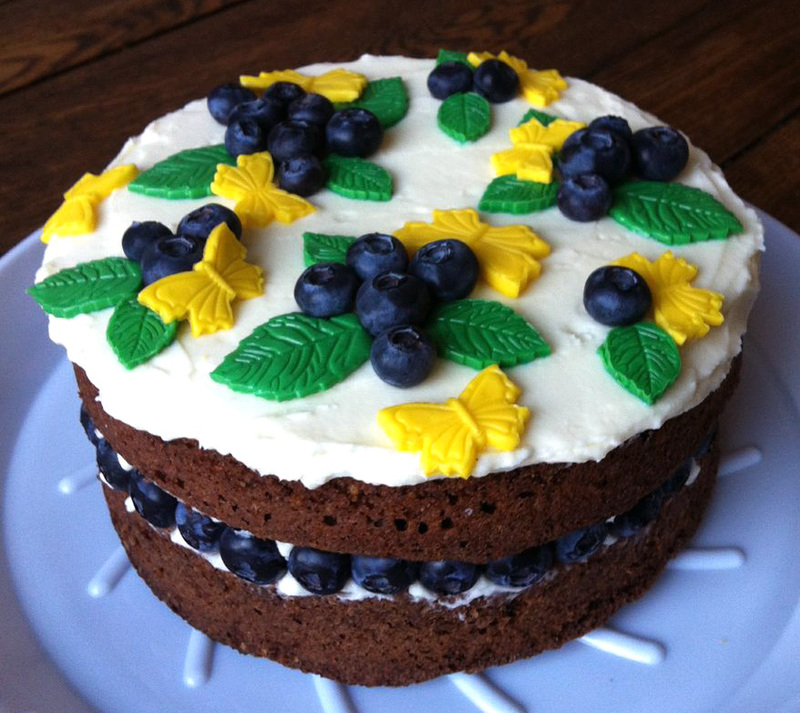 Place one cake on a cake stand, cover with the blueberry jam and spread a layer of blueberries on it. Beat the butter, Philadelphia and icing sugar into a smooth cream. Spread half of the cream over the blueberries and smooth out evenly up to the edges. Top with the second cake and spread the remaining cream cheese mixture on top, again smoothing it out evenly. Stick the cake in the fridge for 30 minutes to allow the cream to set a bit. In the meantime, cut out a selection of different sized leaves from green icing and butterflies from yellow icing. Arrange them on top of the cake with small clusters of blueberries. 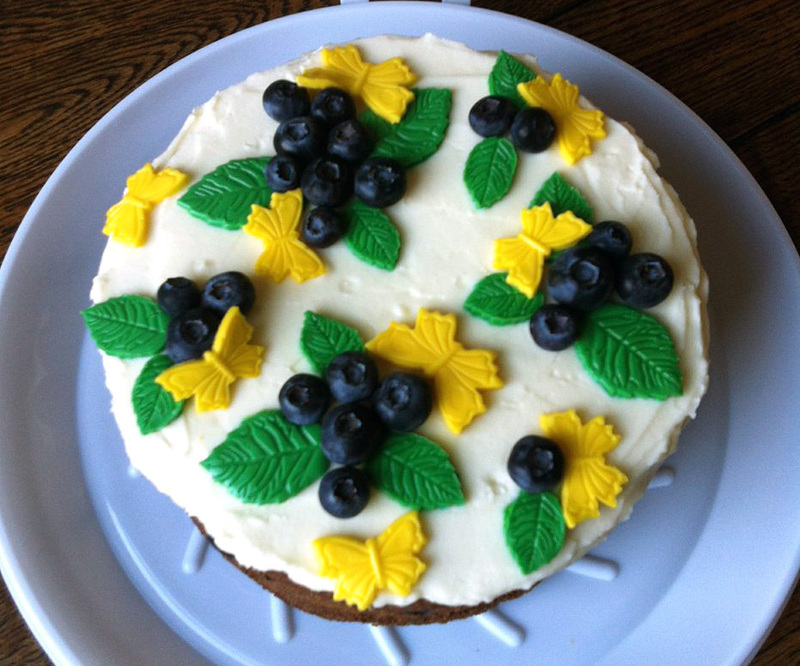 For extra prettiness, push a line of blueberries into the cream layer around the side of the cake. Icing cutters are cheap, and one of the simplest ways to make impressive decorations.